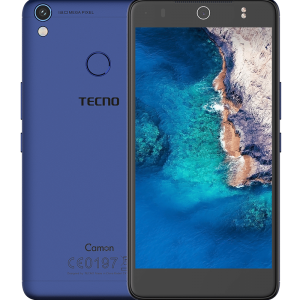 Launched alongside the Camon CX, the Tecno Camon CX Air is a toned down version of the camera ‘champ’ from the manufacturer. Like the main CX, the CX air features similar display size, memory configuration, and software version all for a slightly lower price. The Tecno Camon CX Air is a 4G enabled dual-SIM Android device running on the Nougat flavor of the operating system which is experienced through Tecno’s proprietary user interface — HiOS. The device itself ships in a premium looking plastic chassis which can be picked up in various colors (three, specifically) and features a 5.5-inch IPS LCD display having a resolution of 720 by 1280 pixels resulting in a pixel-density of about 267 pixels per inch (267 PPI). Under the hood of this device sits a quad-core MediaTek CPU (MT6737) clocked at 1.3GHz which is supported by the Mali-T720 GPU for rendering graphics and about 2GB of Random Access Memory for multitasking. For storage, the CX Air is equipped with 16GB of onboard storage which, in the eventuality of you needing more space, can be extended by means of a microSD card. The battery coupled with this chairman is a non-removable 3200 mAh Li-Ion battery which, theoretically, should hold on for a full day on moderate usage before tanking out and for security, you have a fingerprint sensor at the back of the device. Being a ‘camera device’, the CX Air features 13 MP lenses both in front and behind. The rear camera is situated at the top left corner of the device, and a dual-LED flashlight sits directly beneath it. The front facing camera, as seen on the main CX, sits at the center (up top) of the CX Air’s front view. A camera which is also accompanied by a dual-LED flash beside it for lighting in low-light situations. Currently listed as one the best smartphones to purchase in Nigeria under 50k right now, the Tecno Camon CX Air is, at the moment, worth every single penny you be shelling out for it. This device would be particularly well suited for folks who would want a low budget device running on the latest Android versions with a better-than-most camera performance. how much does the touch pad cost? please help me. tecno cx air / nokia 2 : which is better? Thanks. Generally, the CX Air is a better device overall save for the battery endurance. i mean between, ” nokia 2 & tecno cx air” which is the better choice, i want to buy, thanks. If this device is going to be your primary device, I’d say go with the Tecno Camon CX Air.